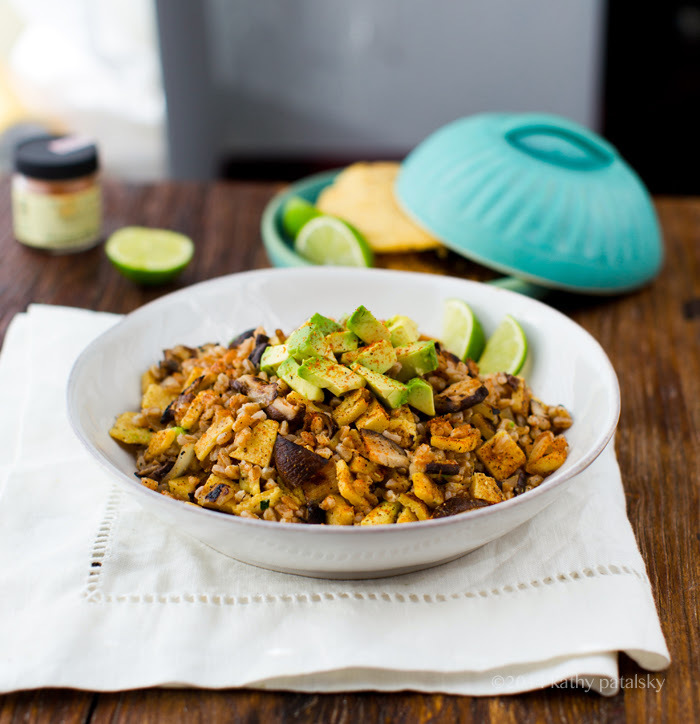 Shiitake Farro Tortilla Salad + Cookbook News to Share! The weather here in LA these past few weeks has been gorgeousful. Yes, gorgeousful. Beautiful and gorgeous all at the same time. And while the winter sun has been working overtime here in SoCal, I have been working overtime too. Mostly because I have been so (happily) busy the past few weeks. 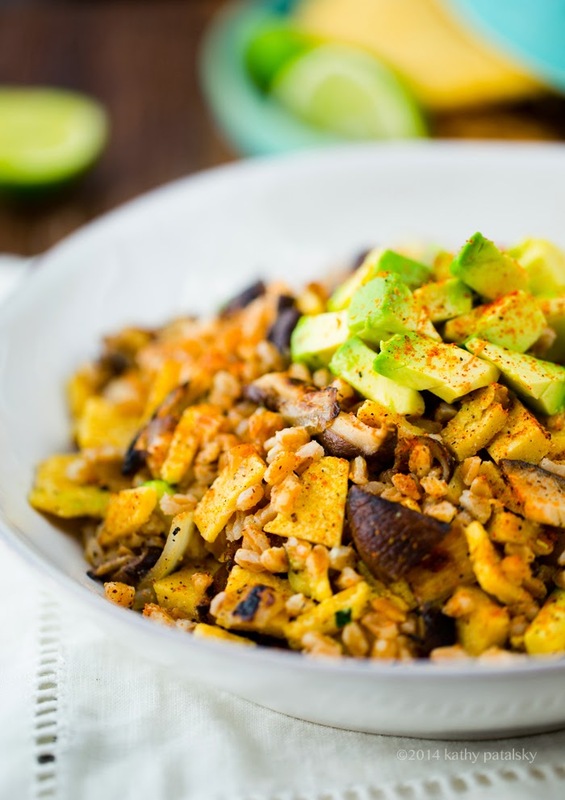 My exciting news to share, plus a yummy recipe for Shiitake-Farro-Tortilla Salad!.. 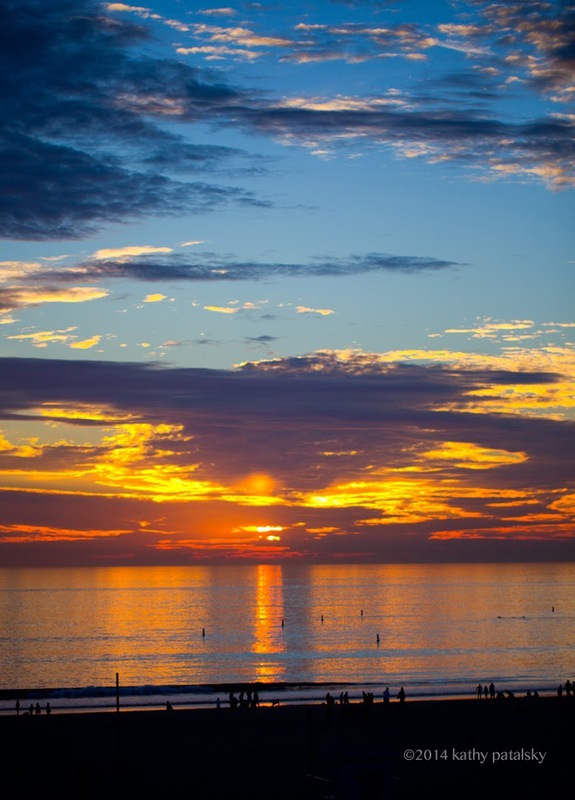 pretty winter sunset over the Santa Monica shore..
Tortilla Salad. Recipes first, always! (And my big news follows the recipe.) So, you know how everyone loves tortilla soup? Well this is tortilla salad. 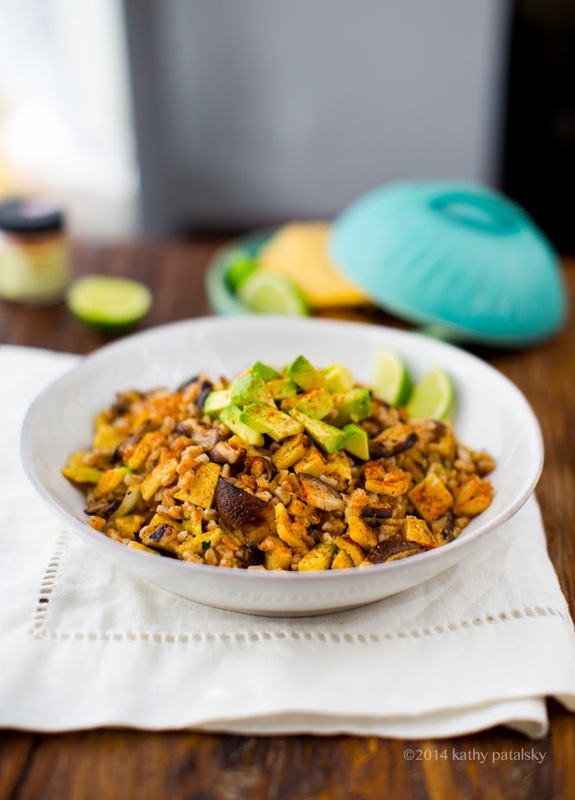 Made using just a few fantastic ingredients including homemade corn tortillas, sizzling shiitake mushrooms, tender rustic farro, fajita spices and zesty lime juice. Avocados on top! Try this yummy fusion recipe out, the flavors are so simple, yet so wonderful all blending together in a big festive bowl..
1. Start off with your homemade tortillas, you will need to combine the masa harina, water, salt and lime juice in a bowl, stire until smooth, cover bowl and let sit for an hour before using. I soak my mixture in the fridge so it is chilled upon using, and easier to handle. Note: yes you can use store-bought tortillas, or substitute with corn, but try homemade at some point, you will be impressed with yourself! 2. While your tortilla mix is soaking, you can cook your farro. Add the grains, water and salt to a small pot and bring to a boil. Reduce to a simmer, cover with lid and simmer on low for about 30-35 minutes, or until farro is tender. If there is any liquid left or excess upon cooking to farro, drain and fluff farro. Pour farro into a large mixing bowl and set aside. 3. After the tortilla mix has soaked, start cooking your tortillas. Warm a skillet, cast iron is my preference, to medium. Roll a gold ball sized amount of corn mixture and flatten into a tortilla shape. If you were using these as actual tortillas, a tortilla press would really help, but since you will be slicing them up anyways, do not stress about making them perfectly shaped. Just flatten them down as much as possible using your hands or a greased flat spatula. Cook each tortilla for just about a minute on each side, they cook very quickly. Continue until all tortillas have been cooked. 4. In the same skillet, turn heat up to high and add in the coconut oil. 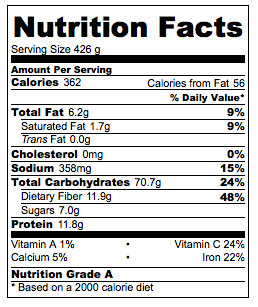 When oil is hot, add in the onions and mushrooms, saute for 2-3 minutes or until cooked. Sprinkle fajita seasoning over top and salt and pepper to taste. 5. Squeeze the juice of one lime into the farro bowl, and add the parsley or cilantro - then fluff the farro very well. Next, pour the warm mushroom mixture into the farro bowl and toss again. Lastly, dice up 2-3 of the cooked tortillas and add to the farro bowl. Toss together very well. Add more seasoning to taste. Pour salad into serving bowl(s). Dice avocado and add to top of salad. Garnish with fresh lime. This salad can be served warm, freshly tossed, of cold after chilling in the fridge. Salsa of hot sauce over top. 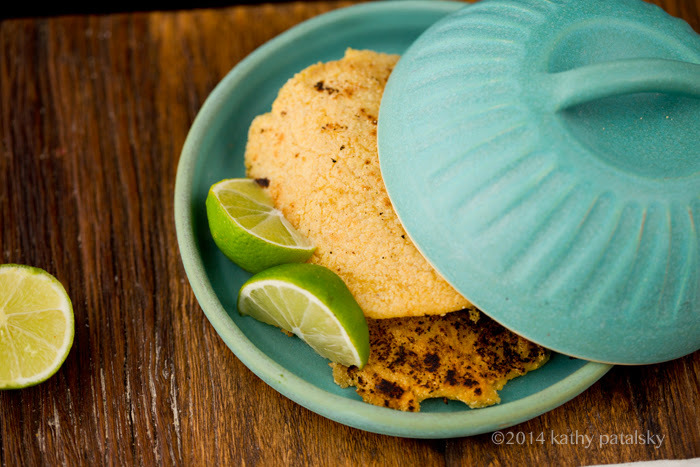 You can serve any leftover tortillas as sides. News News! Soo.. a few months ago I signed a cookbook deal with an amazing publisher, Houghton Mifflin Harcourt. You can follow all the awesome cookbook updates on twitter: hmhcooks and JustCookNYC. So for the past few months I have been working on my second cookbook! This vegan-recipe-packed book will include a wide array of recipes: breakfast, lunch, dinner, snacks, desserts and more. It will be a complete collection of my most favorite recipes. There will be a few of my most popular recipes from here on my blog, but the majority of the recipes will be brand new. I am also doing the photography for the book. 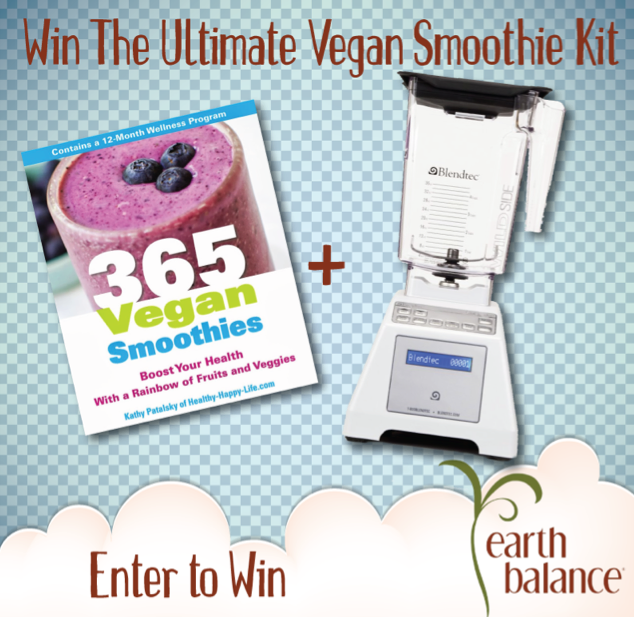 I had so much fun writing 365 Vegan Smoothies and so I am so excited to bring you guys a wider array of recipes in book #2! I wanted to go all Beyonce on you guys and announce my book right before being released next year (2015) .. but I just couldn't hold this news in. So far cookbook-ing has been a whirlwind of grocery shopping trips, piles of ingredients all over the kitchen, day-long sprees of photoshooting, recipe testing and on and on. In short, it has been a wonderful project to take on, especially right now when (as many of you guys know who follow my blog) there have been quite a few heavy things happening for me in the past year. With the sadness over the holiday season, I was so incredibly grateful to have this new project to tackle. I know this book will make miss Nellycat proud. I am so excited to move forward. And truly, I am SO excited for you guys to see this new book.